Within my work in the Application Performance Management business I often see very interesting things. Some things are pretty annoying (performance of ad-services) because they happen every day/hour/minute/second. And it seems to be senseless to fight for better quality here. It seems as if the Ad-Market is aware that it is responsible for keeping the internet as we know it up and running by sponsoring “free content”. Some things are pretty rare but happen from time to time. One of these things recently was brought to my attention by a cool NOC guy who requested help from me to find out what currently happens with the performance of some of their offerings – and why. I digged a bit into the data and found the issue and was able to propose a solution which helped to resolve the issue partly. After seeing that the performance got better I felt enough inspired to share this knowledge with you #webperf guys. With a get method you are requesting the base element of your internet offering (or more but only one domain). To differentiate you own performance you are monitoring one of your main competitors with the same method. After base lining performance you can set up alerts and notifications and maybe leave the monitor running as it is and check metrics only in case of alerts. All the sudden – without any changes anywhere – you get a daily alert. You check the monitor and it looks like this for some of your monitored key pages base elements. This chart represents a week of monitoring with having every single measure displayed as a dot. The two different colors are for the two domains tested. Clearly you can see a performance decrease as a daily pattern and spikes during that time span too. It is also visible that the base line (best performance) is not affected. So somehow you are not getting really slower but you have some issues. To drill down to the cause of what makes the spikes you should remember your test-setup. You might first want to know if this issue is a general issue or a localized issue. Both Tests are now shown in a different way. Not by Test itself but by monitoring location. Clearly we can see a lot of spikes at every location but main interest should be spent on the measurements taken from the Munich node. Back to the first view – but filtered by only the measures taken from the Munich monitoring location looks like this. Scatter Chart from the issueing location only – clearly the baseline is lost. This is a very nice chart, since it shows a very clear pattern – even if that pattern is a bad one. Losing the baseline completely and having a decrease of performance by >100% is not a good thing. Even more interesting – this behavior is focused on only one monitoring location. To check if something is wrong with the monitoring location it might be a good idea to simply chart the competitor’s site which we have in monitor from the same monitoring location only. Competitor chart – same location same settings. Showing not the same performance behavior. Clearly we cannot see the curve as it is for our own content. The problem in the one monitoring location is with us – not the backbone. To start any further thoughts of what might cause it we should have a look to the other data the monitor provides us to exclude issues on specific components of the network communication. The problem is NOT located at the location itself but on the way of our data to the location – on the route. To proof this we can run a trace-route on port 80 (priority!!) from the monitoring location to our data center (if the monitoring tool provides a feature like that). The result of the traces confirms the suspicion. One route went nuts and takes journey cross many carrier networks. 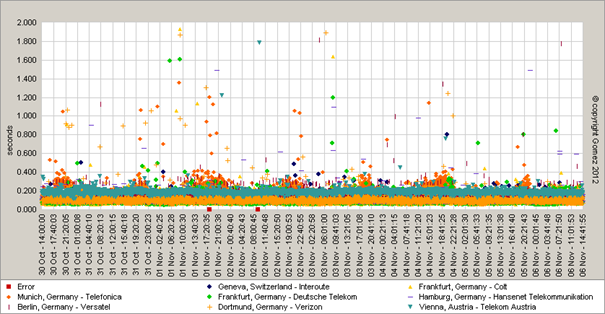 The Trace from the Munich monitoring location looks like this. From Munich the request goes to Berlin than via Frankfurt to Amsterdam to one of the two Datacenters. No question that this route must have impact on the speed of content to be delivered. The timings in between the hops are speaking their own language. With that knowledge you can start immediate actions or do some other validations. Is one monitoring location really an issue for real users? (synthetic monitoring locations are never ever real users – even if some vendors are trying to tell this story). An issue like this must be validated in regards to the real impact on your users. Whether with tests from various end-user locations or with real user data (if real user monitoring is in place). The delay we see is only 100 ms – only for the root element. How much is the delay for all files delivered from your DC to the client? The more files delivered the higher the impact the long route has on performance. To proof the issue for severity we used synthetic tests we did from real end user locations (not real user monitoring). The root object has a pretty high failure rate. Looking at the errors we see socket receive timeouts (Connection gets dropped since no response was receive within time out limits defined by server or client), socket connection resets (bad thing) and a few timeouts. It turns out by further filtering that the domain is less available by users with the ISP Telefonica and the load time of the base object is significantly slower. This is props the thesis that there is a good chance to have an issue which affects almost all users using the ISP Telefonica (and local providers using their network). After setting other priorities for the routing of the outgoing traffic on November 6th.the performance was way more consistent. Performance first day after changing routing tables for outgoing traffic. Giving the fact that web-performance today has an enormous impact on the success of a website most of the readers of this blog entry know the various schools and rules on optimizing the speed of a webpage. Steve Souders as well a well-known and respected leader in web-performance has published books on how to optimize web-pages. Mainly these optimizations take place in the area which are known as the presentation layer – or frontend. Of course before performance becomes important the user must be able to reach your content in the first place. To control the availability and to underline your performance optimizations you will have a monitoring tool in place that allows you to see if you are performing well and you are up and running say 99.9 % of the time for your customers. Depending on the matureness of the web ops or performance team you can have various tactics to monitor both of the requirements (availability and performance). One common and valid strategy for monitoring availability is the “high-frequent request” to your webservers. Availability testing is mainly done by a synthetically triggered request to the domain or IP of one or more specific domains or IP-Addresses. If you want to know if the response of your webserver is correct you must use at least a get request to the base element of the webpage (maybe without parsing it any further) with the option to parse the server feedback for matches of specific words (Like: must exist: ”Welcome”, must not exist: ”Sorry, we have a problem”). So with having a high frequent monitor set up with a get on port 80 for the root element of your web-page we are pretty good in “Monitoring our offerings availability”. Caution: This does not apply for Ajax or RIA driven web applications. This methodology will also not tell us if the web-page as seen by the user is loaded completely – and what time it took to download all content completely. With this kind of monitoring you will be able to see spikes in your datacenter performance – you might be able to find patterns and/or temporary spikes. You will be able to determine impact of changes in datacenter architectures and many things more. But still be aware: only for the root element of the page. This is more than nothing – and should be done by everyone. If you use tools like Nagios placed in your own data center you might not get the full truth told by this monitoring method. Same applies if you use an external monitoring tool with limited network locations. If you monitor from inside of your data center you might not be able to test your ISP capability to deliver content. If you have more than one uplink to the internet by your ISP you will not be able to see if all uplinks are working well. For external monitoring tools with a small network you might miss the performance timings in your key traffic geographies as well as the uplink Information.